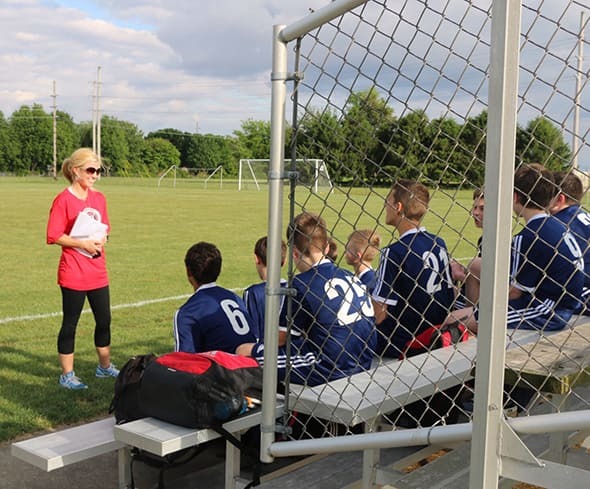 Five years ago when my oldest son joined a club soccer team, they asked for a volunteer "team mom." I assumed that meant bringing some occasional juice boxes and orange slices, so I volunteered. Boy, was I wrong! If you're a team mom, you know what I mean. There are many responsibilities that come along with the title, and you often feel like the team's success depends a lot on you remembering to get everything done. There are player cards, official rosters, tournament applications, hotel room blocks, scheduling meetings and so much more! Here are some tips that I have found to be extremely helpful as a team manager, especially as my boys have gotten older and competitions have become more serious and more important. Have a good folder. This may seem obvious, but our club's administrator was very specific in what type of folder we carry as managers. Keeping everything laminated, organized and in pockets is key to staying on top of things. Keep a backup of everything. I carry a flash drive in my wallet all season with any necessary documents that I could possibly forget. Many tournaments are far from home, so finding a copy store to print everything out would be much better than driving back home for the folder. Use smart phone apps. There are many apps that can make your life easier. Some are dedicated to team management and do it all. Others are more specific like group text messaging, push reminders, volunteer sign-ups, etc. Delegate. Don't be afraid to ask other parents to help out. Chances are they would love to. We have a mom that's a powerful attorney and a great negotiator. When I am trying to get a good deal on something, she is the first one I call! Keep extras in your car. Kids are forgetful. I try to keep extra socks, shin guards, jerseys, sunscreen, bandages, pain reliever and other essentials in my car all season long. Bottles of water are good to keep on hand, too. Keep your cool. As a representative of your club and team, other parents will look to you as an example of how to act when situations arise or games get tense. I try to (kindly) remind our parents about the paper they signed saying they won't coach from the sidelines or act unruly at games. One season, I even had a "penalty chair" that I jokingly put parents in that became a bit too loud! It was a fun way to remind everyone that, at the end of the day, it's just a game!